It’s hard to imagine a Walt Disney World vacation without a character breakfast experience. Cinderella’s Royal Table and Chef Mickey’s still command long waiting lists and require travelers to fit their vacations around their dining choices, but it wasn’t always like that. 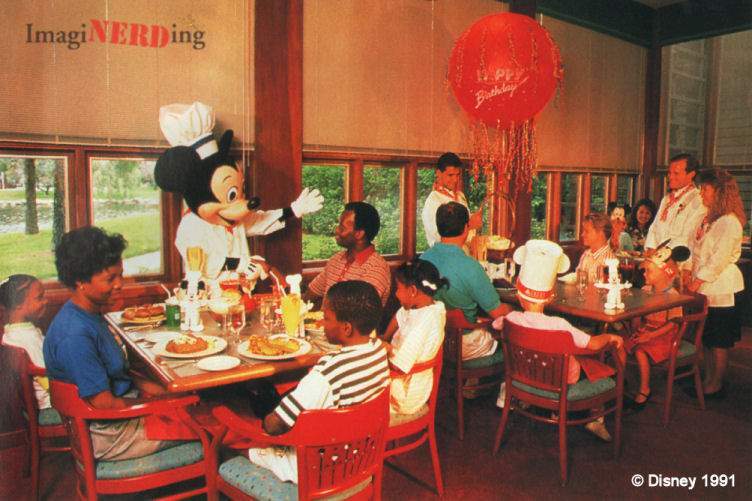 Read on to learn more about how character dining started and some of the changes we saw in the 1980s. In 1977, one of the first character dining experiences was a simple buffet at Cocino Cove at the Contemporary Resort; guests could join Disney characters for breakfast every Sunday. The buffet would move a year later, but not too far away. A 1978 Walt Disney World News offers this glimpse of the Terrace Cafe at the Contemporary: “As an added treat, guests may join the Disney characters for breakfast each Sunday morning from 8 – 10:30 a.m. It’s a delight for the kids- and fun for adults, too.” Reservations were not required. The Cocino Cove was located near the glass wall at the back of the the current Chef Mickey’s dining area on the Grand Canyon Concourse level. So, how did we get to the point where it is necessary to call more than 100 days in advance to make a reservation? Let’s dig into some of our early Walt Disney World publications to look at the history of Disney character dining. In April, 1981, the Walt Disney World News announced the Dining a la Disney evening meal. “Each evening at 5p.m., Walt Disney characters will arrive at the Golf Resort’s Trophy Room to mingle with guests and pass out a gift to each child.” This is the earliest mention of a daily character dining experience that I’ve found besides the 1977 breakfast buffet at the Cocino Cove (which was just once-a-week). On January 27 at 8:30 am our Village Restaurant will host a Breakfast with Snow White. Parents are invited to bring their children to breakfast to meet our famous character; call for reservations. Tickets are $5 for Adults and $4 for Children. I’m not sure if this was a one-time event for employees or a cast preview for something else. On the menu are danish breakfast rolls, scrambled eggs, bacon, hash browns and a breakfast beverage of your choice – all spiced with the presence of your favorite Disney characters, who happily hop from table to table, passing out complimentary “fun gifts” (and making sure everyone’s cleaning their plates!). The 1984 Birnbaum’s Guide to Walt Disney World offers less than a quarter page about breakfast with the Disney characters. 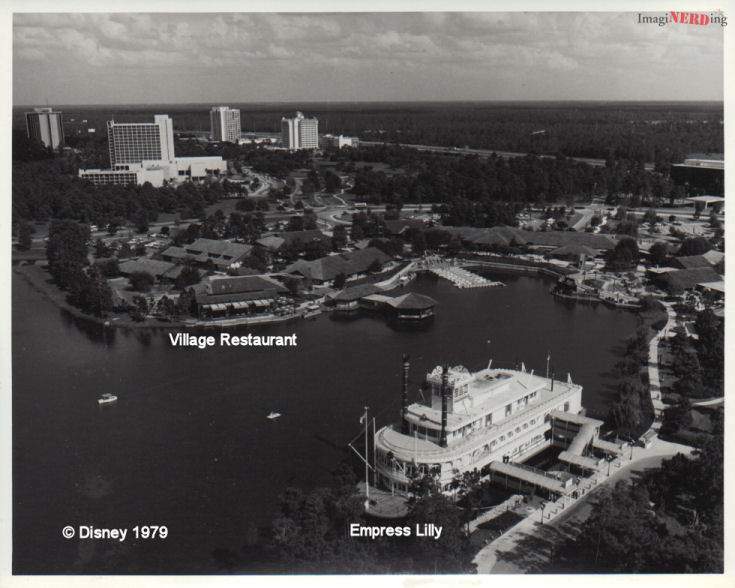 At that time there were three spots for breakfast: the Empress Lilly, the Terrace Cafe (Contemporary Resort) and Minnie’s Menehune (Polynesian Village). An additional spot was available as part of an Easter Airlines package at the Village Restaurant. Reservations were needed at each of these locations except for the buffet at the Terrace Cafe. 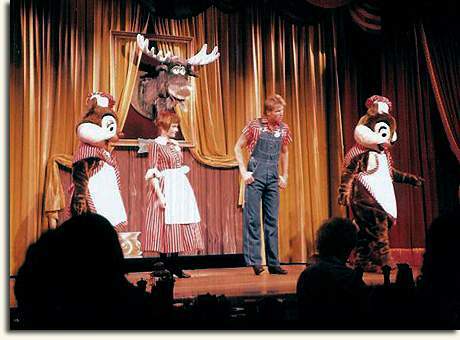 In 1986, there was the Melvin the Moose Breakfast Show at Pioneer Hall at Ft. Wilderness. This was one of the more elaborate character meals and a step towards what we see today. Chip and Dale would take over the breakfast and rename it a Jamboree a year later. The breakfast lasted until 1991. Image courtesy of Progress City USA. 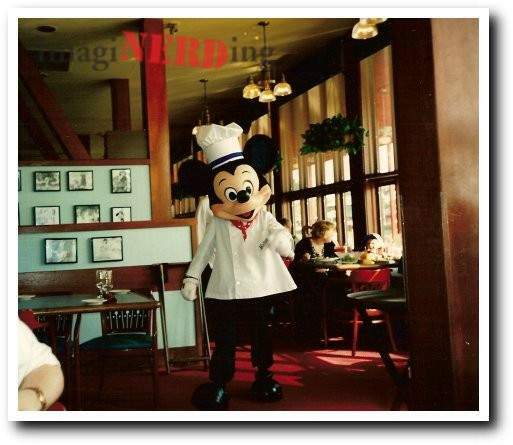 Our next big change in character dining would take place in 1990 and center on the Village Restaurant. Let’s take a look back at the Village Restaurant and its history. 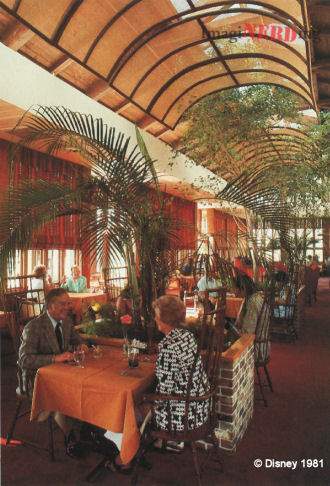 The Village Restaurant was a prime dining location during the heyday of the Disney Village. It was an elegant and subdued dining experience that offered fashion shows and jazz bands in the Village Lounge. A prime choice of afternoon and evening shoppers is the Village Restaurant. Comfortably seated in a countryside setting brought indoors, diners are tempted by unusual lunchtime entrees (served 11 a.m.-3 p.m.), such as Eggs Benedict, Spanish Omelet and King Crab and Artichoke Omelet. They also may choose from among Fried Shrimp, Fried Scallops, or French Dip, Rueben, Beefeater and Turkey sandwiches, and the waist-watchers’ specials, Crab and Shrimp Salad or the Calorie Counter. … The aroma of New Orleans Bouillabaisse simmering on the stove and steaks grilled on an open hearth draw guests for an evening (after 5:30 p.m.) of fine dining. Besides the famous seafood stew, the restaurant specializes in Steak Oscar, Shrimp Mediterranean, Sauteed Frogs Legs and Long Island Duckling. By 1989, Birnbaum’s Guide to Walt Disney World mentions that Cinderella was appearing at dinner at the Village Restaurant. This was also the time that the Village Restaurant would be closed; when it reopened in 1990, it would be known as Chef Mickey’s Village Restaurant providing the template for character dining as we know it. The exterior of the restaurant received the most attention by adding the colorful red overhangs sporting the Chef Mickey logo. At the time, the Disney Village was known for its muted browns and greens, adding the bright red of Chef Mickey signaled a change for the complex. A view of Chef Mickey’s from the Sassagoula River Cruise. During a visit in 1994, we reserved a 5:00pm seating. 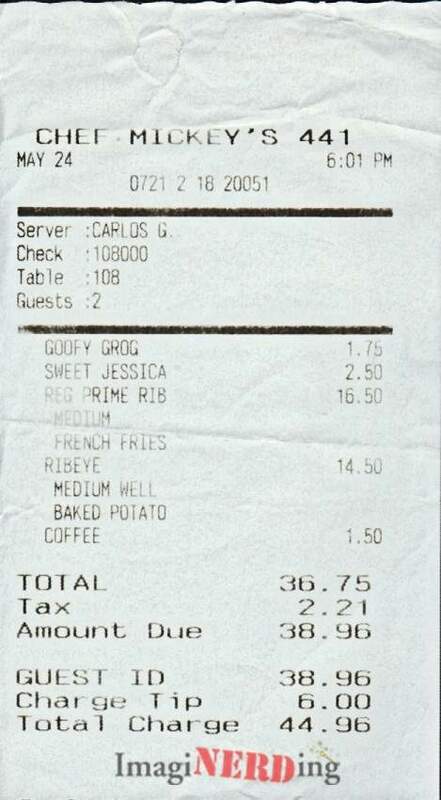 It was surprising to look at the receipt almost 20 years later. Our dinner for two consisted of prime rib, ribeye, baked potato, fries and two souvenir drinks. Even in 1994, $36.75 was on the high side for dining, but it was all worth it to meet the Mouse. Goofy’s Grog came in a souvenir cup and had actual grapes in it. Not grape juice, but whole grapes. Choking hazard, anyone? The Chef Mickey’s Village Restaurant closed on September 30, 1995, it reopened in 1996 at the Contemporary Resort. The Rainforest Cafe took over the spot vacated by Chef Mickey in 1996. To me, the change from the Village Restaurant signifies a change for the entire Walt Disney World complex. It is one of the turning points when the Vacation Kingdom of the World started its march to the Walt Disney World Resort that we see today. What other defining points in Walt Disney World history do you think about? Any fond memories of dining at Chef Mickey’s Village Restaurant?